Wayne is just over 8 weeks into his weight loss journey. He has lost about 65 lbs in that time and has really changed his eating habits and routines. I couldn't be more proud of him. I am, by default of being his wife, on this journey with him. And to tell you the truth, I wouldn't have it any other way. No, I am not eating as strictly as he is, but I have definitely changed some of my eating habits as well. I don't buy most of the things I used to because quite frankly he can't eat most of them. So I buy what he can eat, which at this point in the process isn't much. With Wayne being over weight, we have been down this road many a times before with him dieting and trying so many different things to lose weight. Nothing has stuck thus far, but I think now it has. How do I know? I just do. I feel it. He has changed and I see it in him everyday how seriously he is taking this. It honestly has strengthened our relationship and we have grown closer because of it. The last 8 weeks have been a non-stop mental, emotional and physical roller-coaster, not so much for me physically, but definitely emotionally and mentally. I often wonder if we will ever get off. At this point, today, I am doing great, but if you would have asked me last week how I was doing it might have been a different story. Last week's weigh-in was difficult. You can read about Wayne's hiccup HERE, but I know it is worth it and it WILL be worth it down the road when I have a skinnier and more importantly HEALTHIER Husband and Father to my daughter. That's really all I want, is just for him to be healthy. I want him to be here for Hailey and see her grow into the beautiful woman I know she will be, but I also desperately want to grow old with him, too. I know I'm selfish in that way. He has to have about 5-6 proteins a day. Those are made up of 2 protein shakes a day (1 in the morning and 1 in the evening) and then 3-4 meats per day. He gets the protein shakes through MedShape Weight Loss Clinic. Read more on his blog about them. 1 meat about the size of HIS palm or 4 eggs is 1 serving of protein. We go between chicken, steak, burgers, turkey burgers, grilled chicken patties (nothing breaded) and fish. He cannot have any carbs of any kind. So no bread or buns to go with those chicken patties or burgers...also no pasta, pizza, cereal, rice etc. Think of how many things ARE carbs or have carbs IN them. A LOT! He can have an unlimited amount of veggies, minus carrots, beans and peas. He cannot have those because they have too many sugars in them. Carrots have sugar? Yes, yes they do. He was crushed when he found this out, because that's a veggie that he actually LIKES eating. But we adjusted and now he eats a lot of spinach salad, broccoli and cauliflower, with some cucumbers and celery thrown in there from time to time. He also is limited to two fruits a day, but because so many fruits contain sugar, he is very limited right now as to what he can have. He can have apples, strawberries, raspberries, blueberries and blackberries. All the others are pretty much ruled out. He also cannot have any dairy which means no milk and no cheese. The first 18 weeks of this program are VERY strict and limiting. They pay high attention to carbs and sugars.That is the most important thing in this first phase. After the first 18 weeks he can begin to add some of the restricted things back in, but for right now it's very limited and we're honestly trying not to think about that right now. Take it one day at a time right? 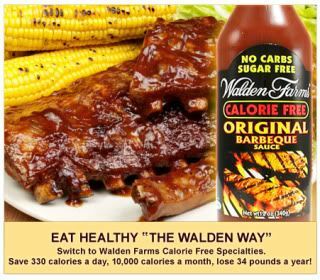 There is also a brand of condiments that you can get at Cub Foods called Walden Farms. They have truly been life-saving in all of this. 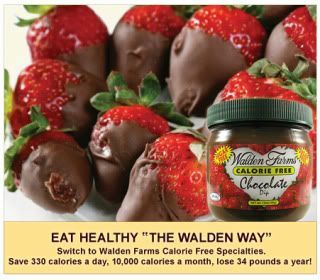 No, we are not getting anything free from Walden Farms for me talking about or posting about this, but they have made this whole process a little easier and I suggest checking out their variety of products if you are interested in any way. If we can help anyone at any point in this process, even a little, we want to. Wayne's favorite is the Chocolate Dip. He eats this with his apples and fruit as a little treat. My favorite is the BBQ sauce. They have 4 different flavors and my favorite is the Honey BBQ. Wayne eats this with all different meats and sometimes even puts it on his veggies. If you do check out the website you will see that these items are generally more expensive than other brands, but if you consider how much you are gaining (not weight, but in other ways) and are really committed to losing weight, then it is priceless. Some of the other things we have tried is the Ranch Dip, Peanut Spread, most of the salad dressings, caramel dip and chocolate syrup. They also have lots of different recipes on the site, that we haven't tried, yet, but will be utilizing when that time comes and he can start adding things back in. As mentioned above, Wayne has started his own blog titled: "Big D's Weight Loss Beatdown!" He will write about the process from his stand-point as he is the one actually doing this. He is doing this diet through the radio station as an endorsement through Med-Shape Weight Loss Clinic. Go visit his weight loss blog, his KDWB blog or email him at BigD@kdwb.com for more information. Also, stay tuned for more updates from me as the journey continues! Wow! He is doing amazing! You really should be proud and so should he! Definitely an inspiration to me and I'm sure many others too! Keep up the good work! We can say diet clinics are Carefully planned, healthy and super slim pomegranate can help you lose weight. So did Big D, meet with a Nutritionist before starting this diet? Great Post BTW (By the Way). It is a clinic type place, so that is why he decided to go with this place. They are an all encompassing place with nutrition and nurses, etc.